Across the street from the India Building, Peter Ellis designed the ahead-of-its-time Oriel Chambers, completed in 1864. The building was reviled in The Builder in 1866 as a "large agglomeration of protruding plate-glass bubbles.... Did we not see this vast abortion--which would be depressing were it not ludicrous--with our own eyes, we should have doubted the possibility of its existence" (quoted in Hughes, p. 62). Ellis' career was cut short by such criticism, and he turned from architecture to engineering. 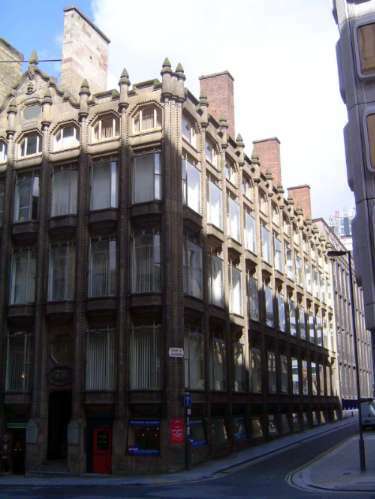 As late as 1921, the Oriel Building was reviled by the head of the Liverpool School of Architecture, Charles Reilly, as a "cellular habitation for the human insect" (Sharples, p. 171).